PAINTED LADY BUTTERFLY LARVAE (5-6 LARVAE PER CUP) CAN BE PURCHASE HERE OR THEY CAN ALSO BE PURCHASED UNDER OUR "POSTPAID BUTTERFLIES" SECTION (SHIPPING INCLUDED). 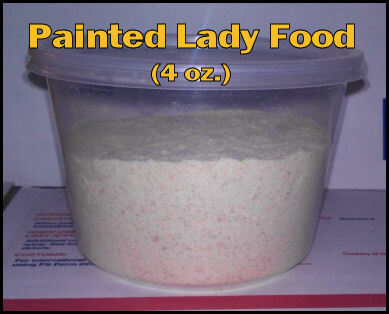 PAINTED LADY FOOD CAN ALSO BE PURCHASED UNDER OUR "POSTPAID BUTTERFLIES" SECTION (SHIPPING INCLUDED). Cup of Painted Lady Larvae (5-6 count) with enough food to raise to butterflies.